Twenty-five years ago, a group of residents, conservationists and agency officials met in Macon County to talk about water. At the time, the Little Tennessee River had no conserved land along its banks, and there was no nonprofit organization around dedicated to protecting it — but the gathering sparked a change. “That conference was really the catalyst for the formation of the Little Tennessee Watershed Association and then later the Nikwasi Land Trust, (both of) which became the Land Trust for the Little Tennessee,” said Jason Love, site manager for the Coweeta Hydrologic Laboratory in Macon County. A reboot of the 1993 conference planned for 9 a.m. to 4 p.m. Saturday, June 16, will aim to unite the community once again around the cause of clean water. Rain, Rivers, Fish and Faucets will feature a variety of speakers and panels on topics ranging from aquatic diversity to runoff prevention to water-based recreation. 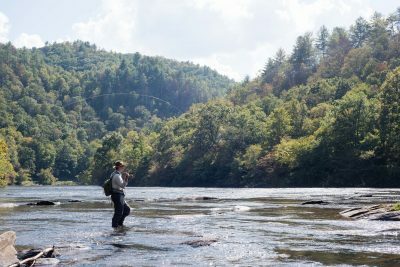 The Land Trust for the Little Tennessee, renamed Mainspring Conservation Trust in 2016, has since become a driving force in efforts to conserve land in Western North Carolina, especially in Macon County. Since its founding in 1997, the organization has conserved more than 25,000 acres and connected thousands of youth to nature in North Carolina’s six westernmost counties and northern Rabun County, Georgia.